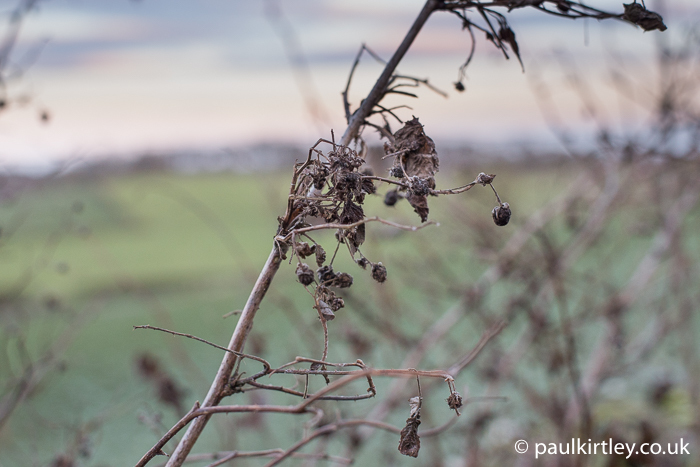 I headed out for a walk on a bright but freezing day in the north east of England. I was greeted by the alarm calls of blackbirds and the curiosity of robins. I could hear wrens chastising me from briars and, in the distance, crows and a buzzard were locked in a dogfight. There is still plenty of life here, even if it is hard at this time of year. 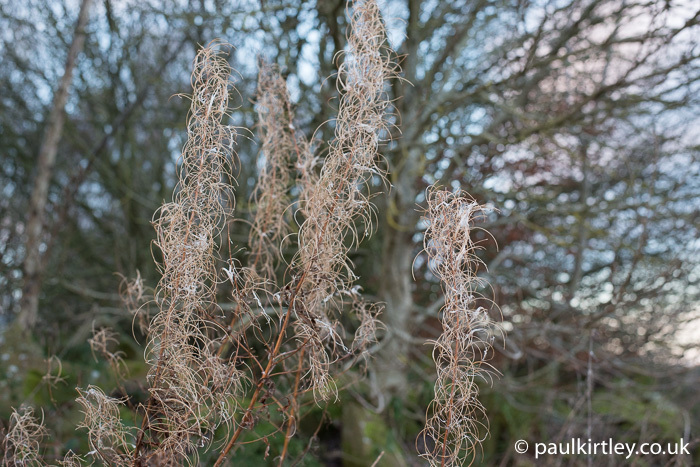 The photos here were all taken on 9 December 2017, in County Durham, U.K.
Rosebay willowherb, a.k.a. 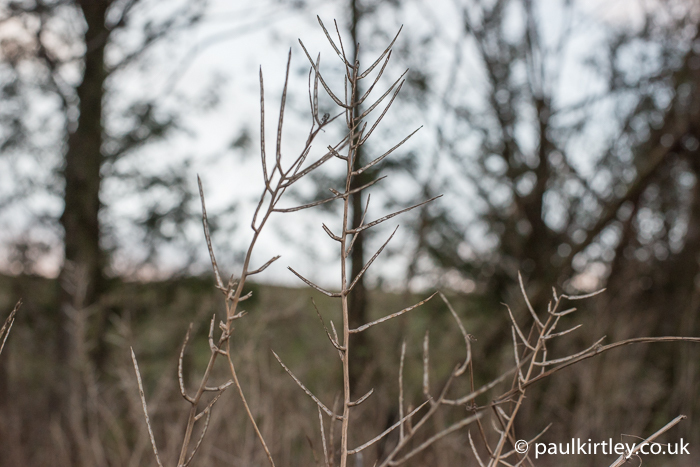 Fireweed, Chamerion angustifolium, long gone to seed but still standing tall. Photo: Paul Kirtley. Frozen in time. 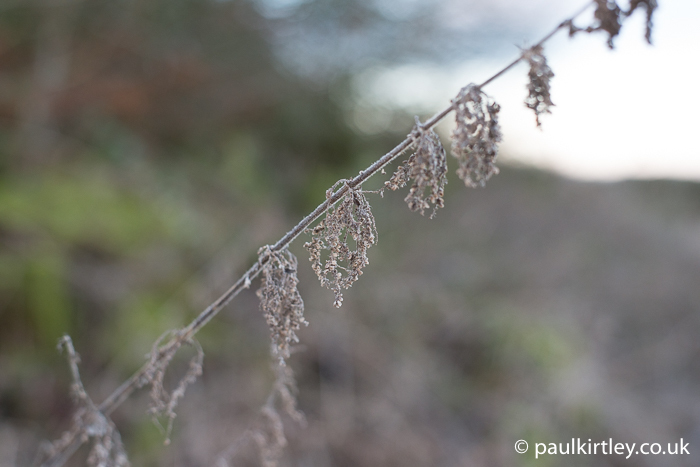 The dead stem of a stinging nettle, Urtica dioica, complete with remains of flowers/seeds. Photo: Paul Kirtley. Lots of detail here. 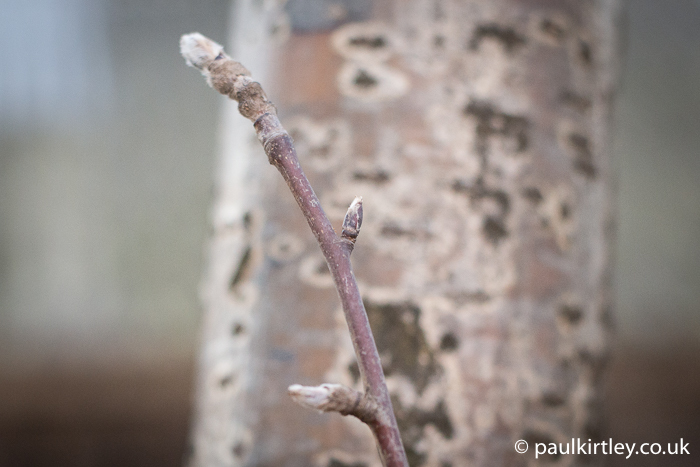 The robust stem of a raspberry plant, Rubus idaeus, still standing as they typically do over winter. This one has wizened fruits still attached though. Photo: Paul Kirtley. 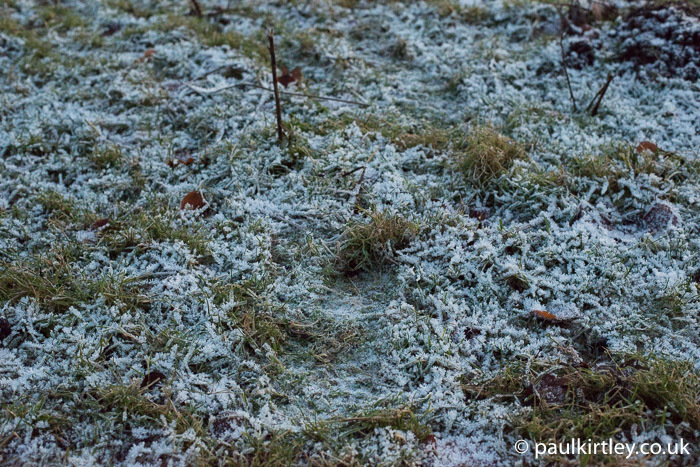 Frosty underfoot with the frozen ground pleasantly firm. Photo: Paul Kirtley. 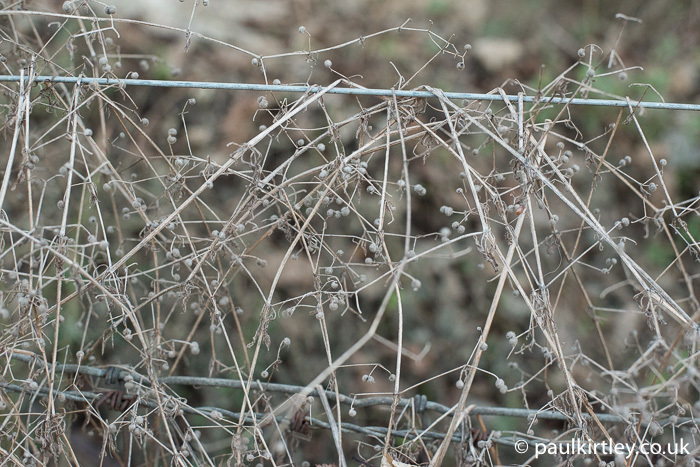 Strands of Galium aparine adorn the fence it used to grow up and over. This plant has many common names including goosegrass, cleavers and sticky-willy. Amongst other things, this makes a good winter birds nest tinder bundle for taking an ember to flame. Photo: Paul Kirtley. 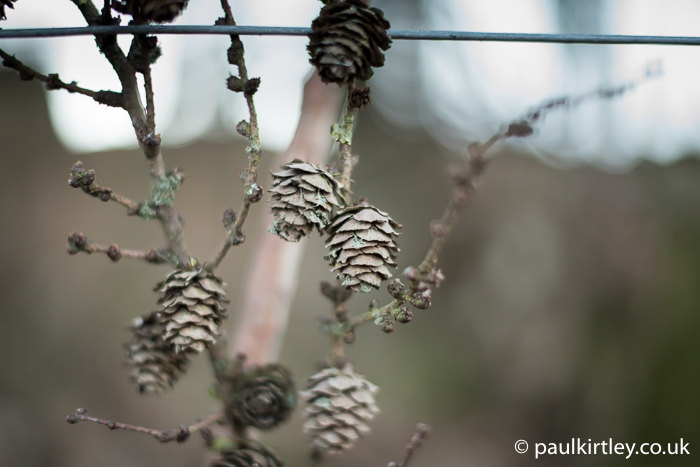 Also caught on the same fence a little further along, a small dead branch of European larch, Larix decidua, complete with cones, which are always want to persist on the branches. Photo: Paul Kirtley. 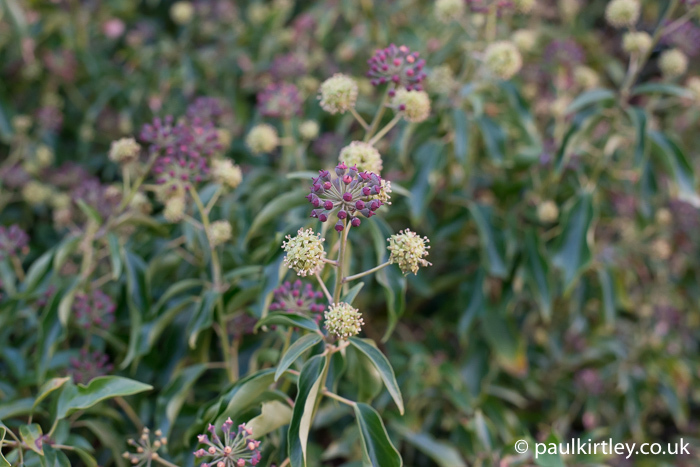 The seasons provide no bounds for this flowering ivy, Hedera helix. Photo: Paul Kirtley. 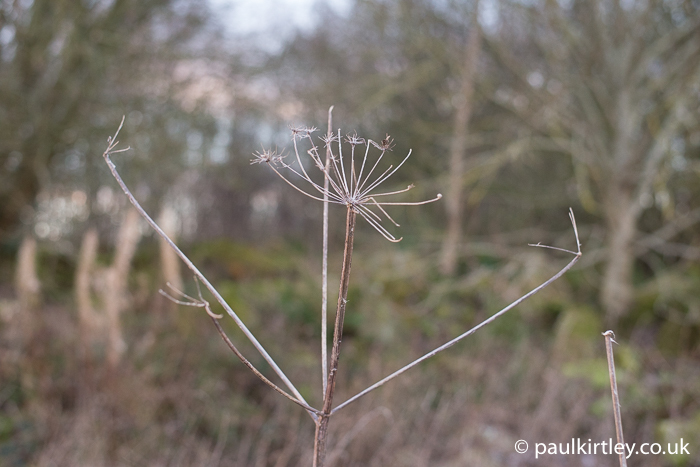 The skeletal remains of the flower umbel of common hogweed, Heracleum sphondylium. Photo: Paul Kirtley. This upright stem of foxglove, Digitalis purpurea stood nearly 6ft/2 metres tall. Where the beautiful purple bell-shaped flowers once were, now the seeds, marking the end of the two-year life cycle of this biennial plant. Photo: Paul Kirtley. 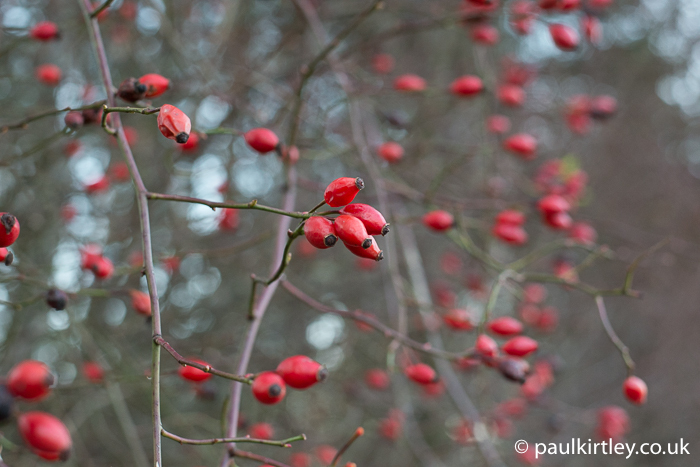 Some welcome winter colour from the hips of this wild rose. Photo: Paul Kirtley. 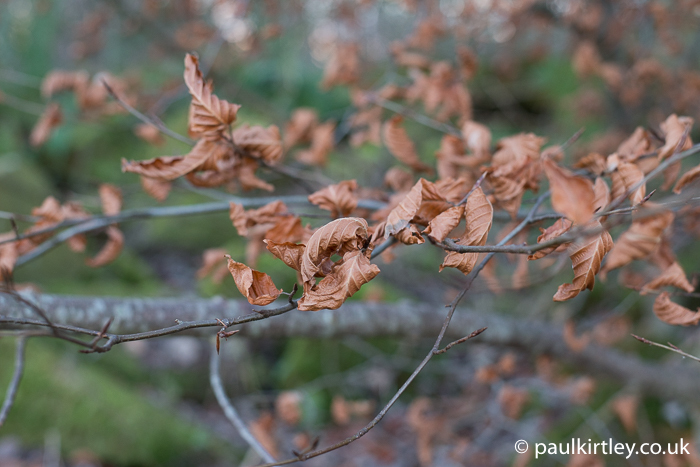 Dead leaves persisting on the branches of young beech, Fagus sylvatica, is very characteristic. Photo: Paul Kirtley. 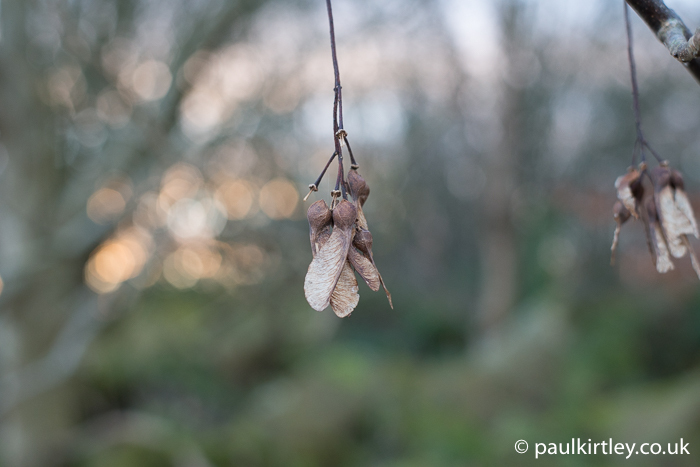 Dangling “helicopter” seeds of sycamore, Acer pseudoplatanus. Photo: Paul Kirtley. The furry buds of rowan or mountain ash, Sorbus aucuparia against the silvery bark of the same tree in the background. Photo: Paul Kirtley. Last bastions of the late summer spray of crimson colour provided by common hawthorn, Crataegus monogyna. Photo: Paul Kirtley. Some greenery still here, beneath the frost. Leaves and thorny stem of bramble, Rubus fruticosus. Photo: Paul Kirtley. Stems of garlic mustard, a.k.a. 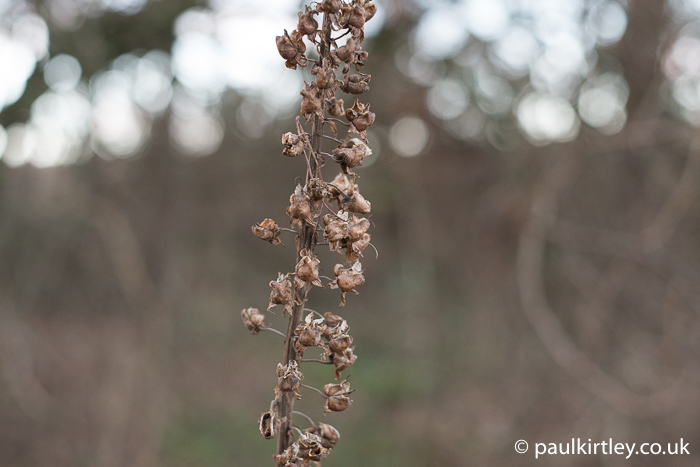 Jack-by-the-Hedge, Alliaria petiolata, holding aloft deserted seed pods. Photo: Paul Kirtley. 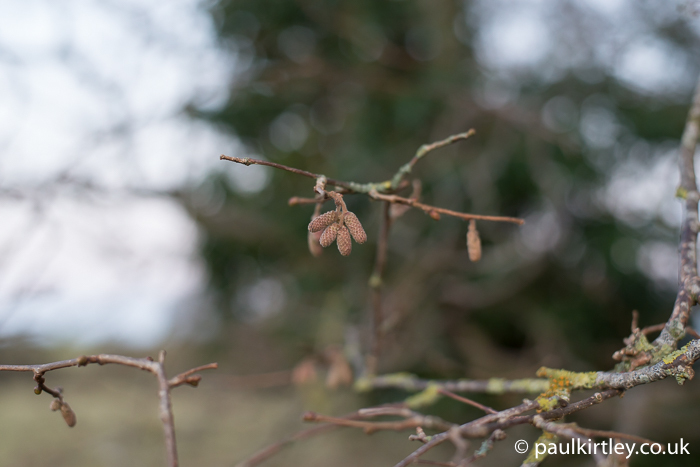 Stubby catkins of hazel, Corylus avellana, already present and waiting for spring before they extend. Photo: Paul Kirtley. 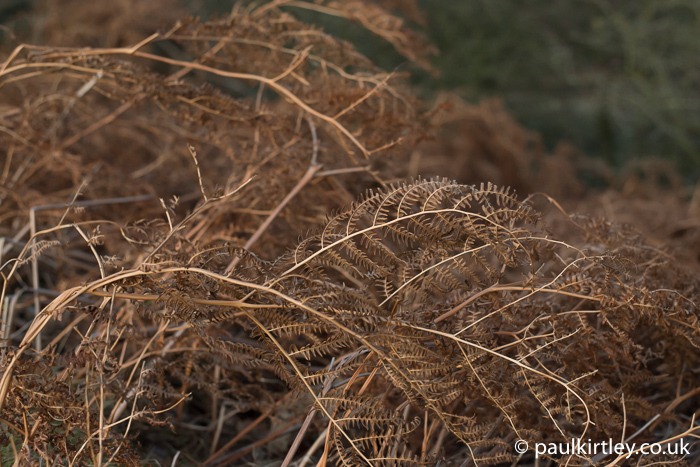 Bracken, Pteridium aquilinum being shown off to its bronze best in the last of the day’s light. This is a great winter fire-lighting resource. Photo: Paul Kirtley. 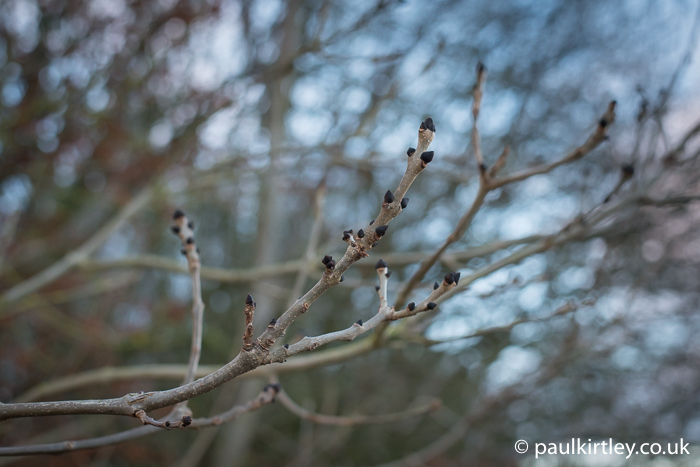 Upturned shoots with black buds can only mean one thing – common ash, Fraxinus excelsior. Photo: Paul Kirtley. 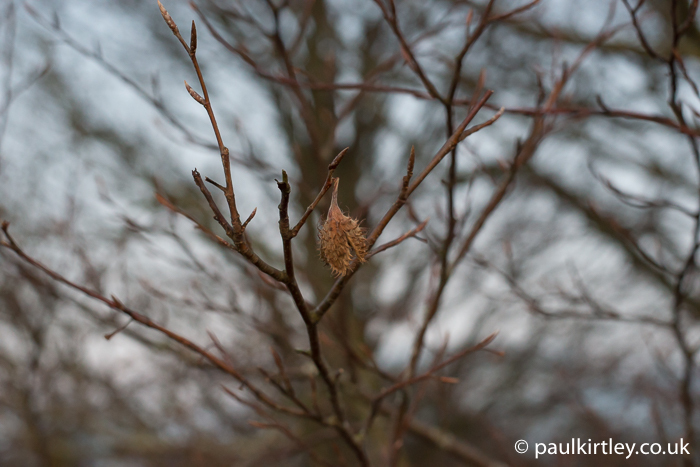 A lone husk of beech nuts hangs from the branches of this large common beech, Fagus sylvatica. Also note the long, pointy buds. Photo: Paul Kirtley. 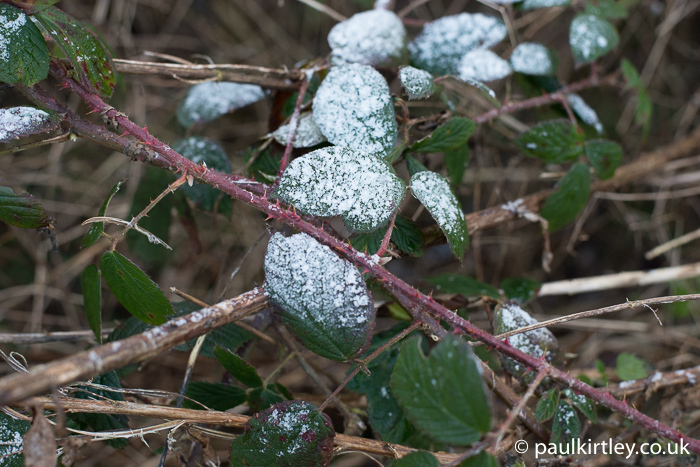 Snowberries, in the Symphoricarps genus, part of the honeysuckle family, provide a splash of white on these dark, naked bushes. Photo: Paul Kirtley. There’s always time for a bit of tracking. Following my own footsteps in the frost back across some fields as the sun dropped below the horizon. Photo: Paul Kirtley. The above photos were taken with my beloved Nikon D800. It was a day where I restricted myself to only one lens and my choice was simple in taking a 50mm, giving a field of view similar to what we see (i.e. not wide angle and not zoom). Everyone needs a 50mm and my favourite at the moment is the Nikkor 50mm f1.8 AF-S. The slight downside with this lens for capturing tree and plant detail is that the close focusing distance is a minimum of 45cm. 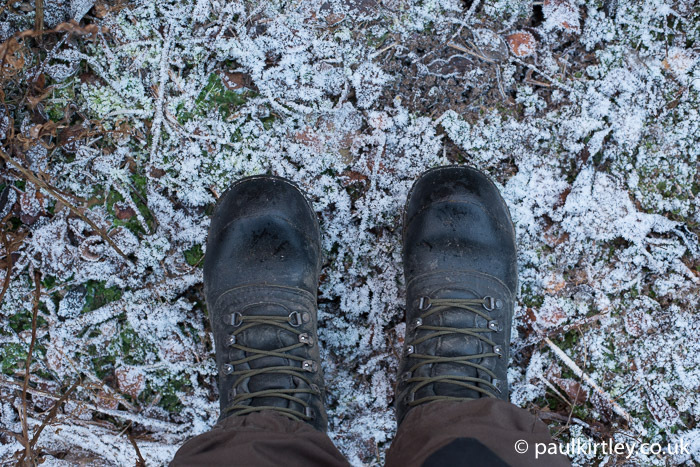 Despite this, having a high quality, fast lens on a winter’s day has advantages. 50mm lenses tend to be inexpensive but don’t let the low price tag fool you. This is a very good lens. Want To Improve Your Tree and Plant Identification? Thank you for that Paul – lovely. I surprised my self and only got one of your photos wrong the raspberries .plants are so different when they are naked ps i like to have the Latin names as well another thing to learn. Thanks for sharing Paul, had to chuckle with the “sticky-willy” name. Enjoyed that Paul, it had a poetic feel to it as well as being informative. Greetings from the South Hemisphere, Paul. I’m literally dripping sweat down here, and this edition of your Wild Wanderings series is especially refreshing. Loved it from start to finish! Another excellent blog. Thank you Paul! What an excellent article, with beautiful photographs. I have been a keen photographer for 65 years and loved every one of your images. I have used Nikon equipment pretty well all of my life and agree with you that a 50mm lens is the perfect optic for the job you have undertaken – as is proved by the quality of your photographs. Lovely photos! I really should unpack my old camera sometime and start taking a few pics. 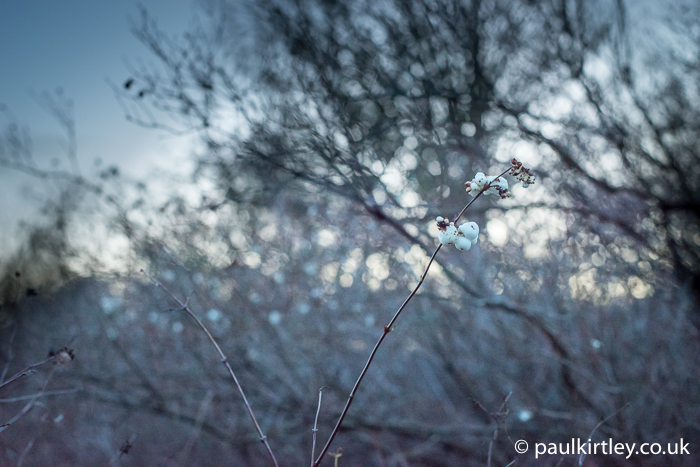 By the way… Did you or anyone else notice something a little different in some of the flowering Hawthorns this year? 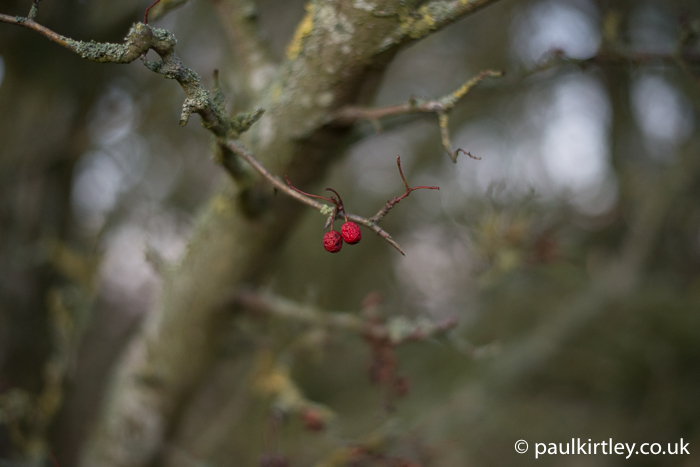 Myself and a friend had been actively looking for pink and red forms of Crataegus locally for the past 3 years. We thought we had come to know where every white one was and had mourned the loss of a particularly fine reddish-pink form that was felled by the Forestry Commission – it had been the only one of its kind that we’d known of in the area and the idea was to increase its number by collecting berries. So imagine our surprise this spring when all around us, many of the Hawthorns were flowering a distinctive salmon-pink colour, including those trees that grow to either side of the track to my house. 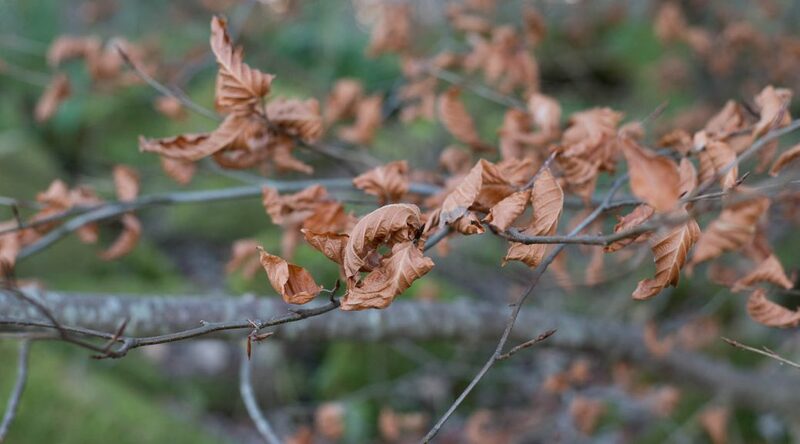 We can’t make up our minds whether perhaps the mild winter of last year had caused a colour change, or whether the very warm early spring was responsible. Or perhaps something else was going on? I found some small reference online to something called the Midland Hawthorn that ‘might’ occasionally change its colour. I’m not sure about this because the article was rather vague. Have you seen something of this nature happening to your local Hawthorns? Hi Debbie, interesting. It’s not something I noticed this year but I’ll be interested to read of anyone else’s observations. Thanks for the continuing education you so generously provide. Great photographs as always. Appreciate all the little “nuggets” you add in. You continue to ignite my desire to get out more and immerse myself in the wilderness. Thanks for sharing. Paul, you are so descriptive in all this article. I feel to nick-name you: “The Bard of Bushcraft”. Thank you kind sir. Verily.